The spotlight shines on three healthcare organizations using technology to bolster patient engagement. From meaningful use and pay for performance to collaborative care models, the pressure is on healthcare organizations to effectively engage patients in their care. Indeed, under stage 2 meaningful use, technology-enabled patient engagement is required. But technology tools on their own do not create an engaged patient; they are only as good as their adoption rate. And adoption requires that providers understand—and be able to demonstrate and communicate—the value patients can realize from utilizing portals, secure messaging, EHRs, and various other forms of health information exchange. The challenges to patient engagement are many. For example, there is no common definition of an “engaged patient.” Also, it’s a battle to carve out the necessary resources to design, deploy, and manage effective patient engagement initiatives. But perhaps the greatest hurdle is the cultural change required by patient engagement. Not only is it necessary to counter a prevailing view that patients are disinterested in being active participants in their care, but it also can be an uphill battle to convince providers of the value an engaged patient brings to the process. It can be done. And when it works, technology-enabled patient engagement initiatives can have a profound impact on the care process. This can be seen in the experiences of three healthcare organizations that are currently running highly effective patient engagement initiatives. In January 2012, NewYork-Presbyterian Hospital (NYP) teamed with Siemens Healthcare to revamp its patient portal to enhance patient interactions and, ultimately, facilitate greater patient engagement. The collaboration was an immediate success. In just six months, appointments scheduled via myNYP.org had increased 42%, and no-show rates declined by 8%. Indeed, the first online appointment request came from an 81-year-old man, further proof that NYP’s patients would appreciate the portal. In fact, myNYP.org was so successful that the hospital and Siemens received the prestigious Collaboration Award from the College of Healthcare Information Management Executives. The award recognizes the best collaborative effort based on its value to the HIT arena in terms of both the teamwork and the overall topic. Using myNYP.org, patients can view and manage their and their family’s health records through a single, sharable account. Available information, which can be moved and stored within a PHR, includes lab, radiology, cardiology, and surgery procedure reports, discharge instructions, medications, insurance, immunizations, and emergency contacts. Patients also can view, request, schedule, and manage appointments; set communication preferences; and receive alerts and reminders. To date, 35,000 patients have enrolled to use myNYP.org. To ensure maximum adoption, NYP continually solicits user feedback to guide updates and enhancements, and new features are piloted prior to full rollout. And while myNYP.org’s success was rapid, there were a few roadblocks. Among the most significant were adoption and integration with business processes and “collaboration with vendors that are willing to be visionary,” Tiase says. The importance of a portal was validated during Hurricane Sandy in late October 2012. While its own patients were not relocated, NYP did receive patients from other institutions. Its providers would have benefited significantly had those patients been able to access their medical information through a portal. “Hurricane Sandy enforced our belief in the importance of a patient portal and patient-owned data,” Tiase says. For Northwest Primary Care Group, patient engagement via a robust patient portal is an integral element for improving coordination of care under its medical home strategy as well as an opportunity to comply with one of the most vexing requirements under stage 2 meaningful use. Its patient portal facilitates communication between the Portland, Oregon-based group’s clinicians and more than 2,000 patients. The most popular features include the ability to schedule appointments, access test results, and request medication changes. From the group’s perspective, the greatest value comes from the efficiencies it creates. Although the portal itself was not deployed until 2008, Northwest’s interest in providing one dates back to 2006 when it adopted what is now Vitera’s Intergy EHR. The ability to have a portal that integrated directly with its EHR was important, particularly given the group’s goal of utilizing the technology to facilitate its medical home. Success required proactively marketing the portal to its patient population and encouraging both patients and staff to embrace the initiative. To keep it fun, a contest was held pitting locations against each other to see which would sign up the most patients. Staff training also was important to ensure they understood the value the portal brings to the patient relationship and to help shorten the learning curve and minimize workflow disruptions. West County Health Centers, a federally qualified health center serving 14,000 patients in California’s Sonoma County, viewed its foray into technology-enabled patient engagement as part of a larger transition to a service-oriented approach to healthcare. The foundation of West County’s initiative is customer service. To reach that goal, it conducted specialized training for frontline staff and appointed a customer relationship manager. A patient portal also has been deployed. However, it is the social element of West County’s initiative that sets it apart, making it a key element in engaging patients to self-manage their chronic conditions. In mid-2012, the center deployed WellFX, a HIPAA-compliant social networking platform that provides patients with a secure and confidential forum for sharing experiences and accessing condition-specific educational content. The technology “changes the framework so patients are coming up with solutions vs. providers or staff. It’s an interesting dynamic because patients are engaging with each other in the context of healthcare delivery,” Cunningham says. Patient adoption, feedback, and activity levels initially will be used to measure the success of WellFX. As the platform matures, effectiveness will be measured based on tangible outcomes, such as improved hemoglobin levels in diabetes patients and reduced recidivism in addiction patients. Achieving those goals requires a specific focus on change management, in particular working with staff and patients to encourage them to engage in and take ownership of the initiative. On the patient side, that includes establishing a patient advisory board to vet platform features and activities prior to rolling them out to the larger population. Training and the ability to dedicate sufficient human and financial resources are also important. Finally, West County works closely with WellFX to provide data and feedback on platform improvements “so we can fine-tune content based on what’s working,” Putney says. In doing so, it helps ensure that WellFX and West County continue to meet the unique social needs of a special patient population. In November 2012, the National eHealth Collaborative released its Patient Engagement Framework, a five-stage guide on how to establish technology-enabled patient engagement initiatives. • Inform Me: This involves basic patient engagement activities that emphasize the use of simple tools to make healthcare more convenient and accessible. Examples include standard forms and information about advance directives, privacy concerns, and specific conditions. • Engage Me: Patients are provided with access to higher-level e-tools and resources, such as EHRs and fitness trackers, and can complete administrative tasks online. • Empower Me: Characterized by the substantive use of HIT, this stage includes secure patient-provider messaging, integration of basic patient-generated data into EHR systems, online quality, safety, and patient experience ratings, and participation in a health information exchange or similar initiative. • Partner With Me: This stage involves using HIT to make patients real partners in care. Organizations provide condition-specific management tools, access to care summaries, and ongoing integration of patient-generated data, such as home health device data, into an EHR. 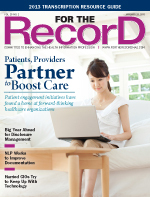 Patient records are connected to public health reporting systems, and coordination of care happens seamlessly across primary, specialty, and acute care providers. • Support My e-Community: Representing the culmination of e-health to connect patients with their full care team and support care management, this stage includes fully interoperable EHRs, record sharing among providers and nonprovider team members, online community support, e-visits, and information to help patients make more informed decisions about their care and treatment. At this point, providers are most likely participating in accountable care organizations or medical home models. The framework’s design, which is organized to build on capabilities, took into consideration several existing resources and patient engagement measures, including those required by stages 1 and 2 of meaningful use. The framework is available for download at www.nationalehealth.org/patient-engagement-framework. The collaborative also has released the Consumer eHealth Readiness Assessment, an online tool mapped to the dimensions of the Patient Engagement Framework. Available via subscription at www.nationalehealth.org/cert, it monitors progress and supports strategic development of consumer engagement activities.